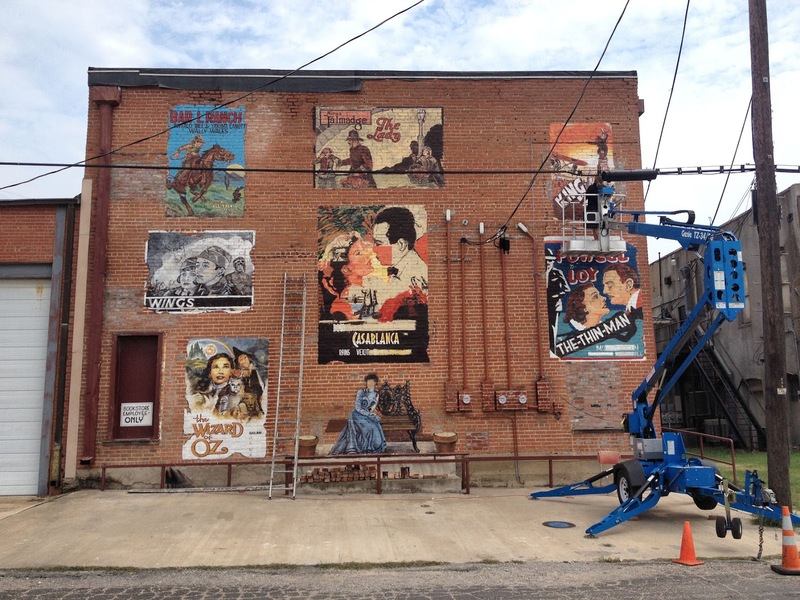 Saturday morning I happened to be traveling down the south side alley and noticed new art work going up. Seven old movie poster type murals are being painted on the back of Books and Crannies. Books and Crannies is a great new and used book store in Terrell on Moore Ave. The book store is in the old Iris theater building. I'm sure all of these movies at one time played on their screen. The movie at the top center, The Lady, with Norma Talmadge was the first movie that played in the Iris when it opened on September 1, 1925. Tickets cost .25 cents each. The bookstores owners, Ron and Gayle Harris, restored the Iris sign on the front of the building and it was lit up on September 1, 2008. Currently there is a small theater in he back of the bookstore that houses live plays and old movies. I'm going to have to drive down the alley again this week and see if they finished up.